Because blackberries help fill you up, but are low in calories, they make an excellent addition to any healthy weight-loss meal plan. 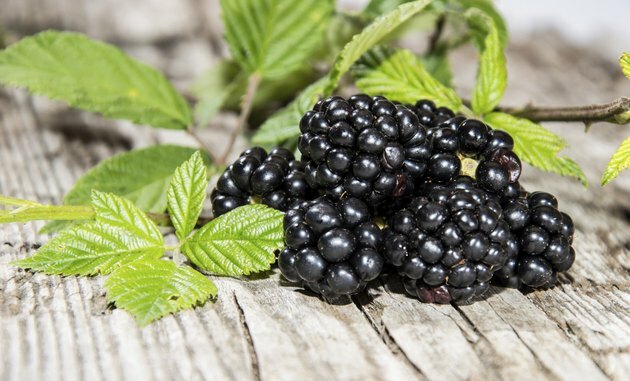 However, because blackberries lack some essential nutrients that help enhance weight loss, don't overindulge in blackberries during your weight-loss journey. The main determinant of whether or not you'll be successful losing weight is your total daily calorie intake. Blackberries contain a large amount of water, which is why eating them is a low-calorie way to fill you up during weight loss. One cup of raw blackberries provides you with only 62 calories, according to the USDA National Nutrient Database. Calorie recommendations for weight loss usually range from about 1,200 to 1,600 calories daily, according to the National Heart, Lung, and Blood Institute. Blackberries are packed with dietary fiber, containing 7.6 grams of fiber per cup, reports the USDA. High-fiber diets enhance weight loss in obese individuals, according to the article, "Health Benefits of Dietary Fiber," published in 2009 in "Nutrition Reviews." Authors of the article recommend consuming 14 grams of fiber for each 1,000 calories you eat -- which is 16.8 grams when eating 1,200 calories a day and 22.4 grams of fiber daily when following a 1,600-calorie weight-loss plan. Although blackberries do contain some protein – 2 grams per cup, according to the USDA – they are classified as a low-protein food. Protein is useful during weight loss because it helps your body burn more calories and it boosts satiety, according to the 2009 study, "Single-Protein Casein and Gelatin Diets Affect Energy Expenditure Similarly but Substrate Balance and Appetite Differently in Adults," published in "The Journal of Nutrition." To increase the protein content of your meal or snack, try consuming grilled chicken, low-fat cottage cheese, low-fat milk or yogurt, tofu, a turkey or veggie burger, nuts or seeds with blackberries. Overindulging in blackberries means that you may be getting too little protein or healthy fat in your weight-loss diet. Therefore, it is important to eat blackberries in moderation, especially during weight loss. The Dietary Guidelines for Americans 2010 recommends eating 1 cup of fruit daily when eating 1,000 to 1,200 calories a day, and 1.5 cups of fruits when consuming 1,400 to 1,800 calories per day.